My favourite cafe by far remains Caffe Nero, the best atmosphere, top quality food, the comfiest chairs, the best environment for reading and consistently high quality all over the country. It’s hard to choose between so many great Caffe Neros but how can I not choose my local, just down the street in St Annes. I re-discovered the joy of good toast (it’s cheap) and was amazed at how variable the quality of such a simple food can be. The best toast by far was from Berties in Lytham, I went back for seconds and I’m looking forward to going back again once I’ve finished my current whole food from the garden challenge. Going to one and often two cafes a day, gets expensive, hence the focus on toast! Esquires in Scarborough cafe number 26 only 4 days & 4 cafes left for this challenge. Filey Country Park Cafe number 23 on my 30 day challenge. I love this place! 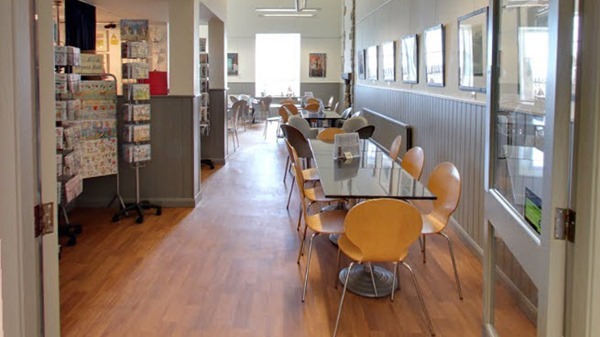 Blackpool Central Library Cafe is the 16th destination for my 30 day challenge, free magazines, comfy seats, low prices, great art-work and quiet — top spot! At Cafe Cove for day 13 of the 30 cafes in 30 days challenge hard to beat the view! It’s probably worth noting that some of the cafes on this list had many repeat visits and other’s didn’t get a mention because they were the second or third cafe of the day. All told I probably visited 60 cafes in the 30 days, but only 32 unique ones, of which only 30 made the list. The picture I chose for this post was from Swell Cafe at Robin Hood’s Bay. It’s very busy and expensive, but has fabulous views from it’s terrace. Ironically it was my third cafe of the day, so it didn’t make it onto my list, but it made it into this post because it has a superb entry on google maps that allows you to go on a virtual tour of the inside and outside, really impressive.